I am re-posting my review of This Land is Your Land in honor of Pete Seeger’s passing. 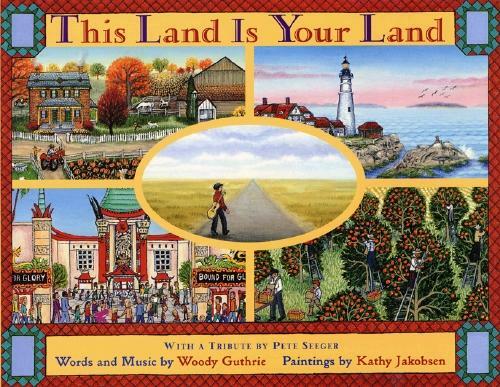 This Land Is Your Land, words and music by Woody Guthrie; Paintings by Kathy Jakobsen, with a tribute by Pete Seeger. Little Brown and Company, 1998, New York. This familiar song never “looked” quite so beautiful. Jakobsen’s paintings successfully depict the beauty of America, while at the same time illustrating the hard times Woody Guthrie sings about. This edition includes all of Woody’s verses, some of which are conveniently overlooked when school children sing the song. Those verses, though, are at the heart of what Woody Guthrie stood for. The first page that illustrates a devastating time in our history is this one: “W hen the sun came shining, and I was strolling, And the wheat fields waving and the dust clouds rolling…”. The painting shows an idyllic farm with blue skies over head. But look closer: in the distance is the black cloud of dust so familiar to farmers during the “dust bowl”. Look even closer and the reader sees a farm wife running to her baby—who just moments ago was playing happily on a blanket outside—to get her indoors. Father and son rush to the horses to get them in the barn and other family members point to the sky. A lot of history is told in that one double spread painting. As Woody goes walking that “…that freedom highway” another double page painting, shows a community center offering services such as day care, life skills classes and drug rehab. The pages on which the familiar chorus is sung has intricate, detailed pictures children will love to pore over. The first chorus is accompanied by a full page painting of San Francisco Bay. The facing page—New York City with twin towers intact. Another double spread shows all the singers that have sung Woody’s songs over time. Pete Seeger pops up as well as Ledbelly, Joan Baez and many others. This book is like a history book. Not the history of wars and battles, but the history of the people of this country: people struggling against nature, hunger and social systems deaf to their needs. But it is also a celebration of the vast beauty of this nation with its redwoods and wheat fields, mountains and ocean shores. Well, I could go on and on. Just buy this one. Do it. Give it as a gift to yourself or a friend—of any age. You’ll be glad you did. Stephanie, this is one of my all time favorite picture book titles. The intricate illustrations, side bars, and color rise to the level of the original lyrics. I wish every child had a personal copy of this book. Thanks for reposting this.